Tuesday evening, when we went to the Passover Seder, I knew that many parents, teachers and students from my son’s school were at a very important board meeting. As I have mentioned before, our school was put on the chopping block because of major budget cuts. We have rallied as a school community, signed petitions and written letters. Still, this was the first board meeting since the announcement and many ups and downs along the way. The district scheduled this meeting on the night of the second Passover seder. It made me upset the minute I realized this. Of course, it made me even more upset when they rescheduled a meeting that was to be held today. Why? It is Holy Thursday and this was not acceptable to the board. I opted to keep my mouth shut and pick my battles, but made it known that I was not happy. I am not looking into religious discrimination because of this matter. Last night, when we got home from the Seder, I tried to find news about the meeting. There was nothing, not even e-mails from other parents. I figured that was good news. 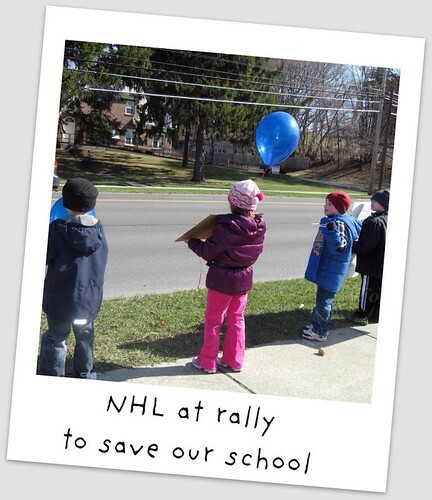 This morning, I called NHL in from school and the school nurse asked if I had heard the news. No, I knew nothing. She told me that they brought up closing the schools again last night. In fact, this time they wanted to do a vote, but the members would not do it at the time. Wednesday morning and afternoon, I spent a lot of time on the telephone and at my computer. I talked with several of the other parents that have been making the rounds to important people in our community. I heard more about statements that were said at the board meeting and got pretty angry at the blatant disrespect some members had toward our school. From that second on, I was a Mommy on a mission. I made called to the mayor’s office, assemblyman’s office, senator’s office, district communications director and several school board members. I managed to get to one of the school board members and talked with her for quite a while. Information was given to me that started phone calls to members of the school to get the word out about an emergency meeting. Several mothers made fliers and I stood outside in the rain handing them out to other parents and teachers in the school. This was news to everyone. We all know times are tough, cuts will be made and jobs will be lost. What bothers me is that schools were picked randomly and not based on anything. Rather than close a school with enrollment that was declining and testing not meeting state standards, they picked on us. Our school has met state testing standards consistently and has a budding enrollment. Something was not right here and it needs to change. I am not backing down even though they claim we are safe for this year. I am going to keep battling along with others in our school to make sure we are a role model of things that are done right. We will be getting the word out to everyone about our successes and fabulous teachers, kids, community and parents. This is the least we can do for our kids. We MAY be safe this year, but I have been warned that next year may only be worse. We are in for a long fight. The last few weeks have taught me lessons and made me feel like more of an adult than ever before. I have now had to fight for my child’s school to stay open, something my parents never had to do for me. Have you had to do this before? If you have, what has your school done to show the powers that be you are not going to give up for your kids? Ew to everything about this. Just, ew. Like sausage being made. It’s amazing how people in leadership positions can be so ignorant and unfair. I hope your efforts change their minds. .-= Holly at Tropic of Mom´s last blog ..Busch Gardens’ Sesame Street Safari of Fun =-. Glad that you’re standing up for what you believe in Beth. It’s important to have folks like you involved. .-= RobMonroe´s last blog ..Something New for Me: Menu Monday =-. Good for you for getting involvec, speaking out and organizing. Hopefully, your efforts will make a difference in your community.